Resource factor: Fomento Resources’ Guelliem-E-Gaval iron ore mines in north Goa. 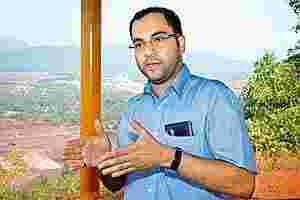 Pissurlem, Goa: The shadow of illegal mining on Goa has thrown miners into limbo. 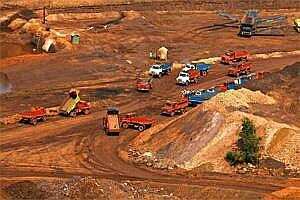 Their investments, thousands of jobs in the industry and decades-old international trading relationships depend on the findings of the government-appointed Shah Commission, which is investigating the extent of illegal mining in Goa. Ambar Timblo, managing director of Fomento Resources and the third-generation head of the company, defends the industry and says that if curbs are placed on exports, it will have no avenue left to stay in business in Goa. The company’s clients include Japan’s Sumitomo Metal Mining Co. Ltd and Nippon Steel Corp., China’s Rizhao Steel Co. Ltd and Baosteel group, as well as ArcelorMittal, JSW Steel Ltd and Noble Group Ltd.
What are some of the knotty issues in Goa’s mining sector? We are complying with all regulations that are required. There is a lot of talk that illegality exists. Looking at the other states like Karnataka and Orissa, they really get categorized into four areas. One, not paying relevant royalties. Two, working outside the mining lease area. Three, working in forest areas without clearances. And four, violating your environmental clearance. I think on a majority basis, no operation in Goa falls under these heads. In other states, 85% of mining activity is in forest land, so you require forest clearance, whereas in Goa, less than 18% of mining area is in forest areas. It is virtually impossible to evade royalty in Goa because all iron ore moves in one direction for export through the two ports and you have so many checkposts. So, at the end of any day, you know exactly how much mineral has left Goa. And the fact that all of it goes in one direction makes it easy to tally the exports with royalty received. Do you think it is correct to export the dumps (piles of rejected earth left after mining)? When mining takes place, you get non-ore and ore material. Non-ore is classified into clay material, sub-grade material, etc. As a conscious and scientific miner, you have to segregate the types of ore because you don’t know if at a later date it could be of use. When the propensity of China to use that ore exists, it is actually environmentally better to use that opportunity to sell it to them. There are provisions under the law that say that as long as you pay the relevant royalty, these wastes can be sold. Also, environmental clearance given by the government specifically states that each company should endeavour towards 0% waste mining and if there is an opportunity through value addition or through buyers willing to buy low-grade, sub-grade minerals, that opportunity should not be missed. That’s a condition put to us. But clearly not everybody sees it that way. They say you are excavating age-old dumps that need to be restored. I can defend it legally, but yes, there is a feeling that you may be excavating dumps which are legally okay to export, but in the name of that, you could be extracting fresh material and camouflaging it by saying it is old ore. The state government is looking at a mechanism under which to monitor and regulate just the dump and waste movement. We have to cooperate and find ways to make things more transparent so that people actually see that we are moving ore that is produced under statutory compliance. What are some of the other grey zones where clarity is needed where miners don’t know whether they are breaking a law? Because of the amount of economic attention this industry has got in the last four-five years and because there have been various developments in other neighbouring states, there is obviously a perception that Goa wouldn’t really be far behind. I think we are just going to have to go through a period of having to explain ourselves more than that in the past; put as much information on the table as required in order to prove our bona fides. Because to me, if the laws are actually followed and are enforced under the spirit under which they exist, I don’t think there would be any ambiguity. It can’t be that there is not enough law, I think there has to be definitively more transparency and more enforcement. What are you doing to improve this negative sentiment? We have got a new electronic system which has linked all our weighbridges to a display board, so anything that leaves this mine is displayed electronically. All our trucks have radio frequency identities. We think certain steps like this need to be taken. We need to differentiate ourselves from possible violators. We hope that over a course of time, the government, which has also initiated steps in that direction, will develop its interfacing opportunity with us so we can interface our information with it. In the worst-case scenario, what is the plan for miners like you to carry on with business? If there is a decision to suspend activity for a momentary period, it would be unfortunate, because a large part of the economy and all that is spent on this activity will be hurt. I don’t think Goa warrants this at this time. Can you tweak your business and very quickly supply to the local industry that has now started using or talking about using new technology, where mostly low-grade iron ore fines can be used? Can that be your saviour? The feed ores for all those technologies are north of 62% Fe (iron) even today. We would be the happiest persons to supply to the local steel industry. We have even invested in beneficiation technology, where we upgrade our low-grade ores. Even after the upgrade, the steel industry does not want to buy our ores. In Jharkhand, the ore they use in their plants is 65% Fe, their waste is 62.5% Fe. In Karnataka the ore is 62.5% Fe, their waste is 57% Fe. Our ore is 57% Fe, our waste is 48% Fe. So, we are at the bottom rung. The new technologies are moving from the ores available in Jharkhand, what is available in Karnataka, whereas we are geographically and geologically suited to China. Indian domestic logistics also make it difficult for us to supply low grades to local steel plants. It would make no economic sense. The Goa Mineral Ore Exporters Association and Sesa Goa Ltd have said that inadvertent errors may have happened in Goa’s mines. Are your mines also one of these? This is not an exact science. There can be non-malafide mistakes, wherein the intention wasn’t effectively to cheat or to compromise. But looking at the depth and the size of the rules and laws, if the intention of a person was to find fault with somebody, and he would want to use a fine toothcomb, he will find errors in almost everything. If you have to look at it in terms of violations and types of violations, we would be coming out as one of the most responsible mining locations in the world. Fomento purchased Tata Metaliks Ltd’s Redi pig-iron plant in September. What was the rationale behind this purchase? How will pig-iron capacity help you continue your business as the production of iron ore slows? Fomento operates a mine adjoining the Tata Metaliks Redi Plant and substantial synergies can be unlocked. Fomento has consistently invested in beneficiation over decades and the Redi plant acquisition is in line with that approach. With our locations in three states for resource allocation, we will be evaluating various technical replacements and alternatives, to enhance the mineral utilization and economic yield to the optimum. Next: A profile of Goa’s powerful activists driving their campaign against companies and the authorities.